TO SUBMIT AN ABSTRACT FOR CMEPALOOZA SPRING! 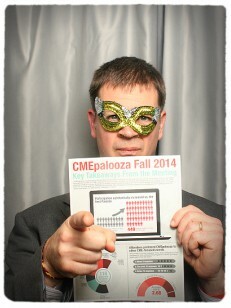 Yes, I know the paper I’m holding says “CMEpalooza Fall”; just work with me here. It’s all I had when I was forced against my will to enter the PlatformQ photo booth at the Alliance conference last week (Lies. I entered willingly. Scott refused and I think we’re all the better for it.) Anyhoo, happy Friday y’all! (Philadelphians, that’s Texan for “youse”. Pittsburghians, “yinz”.) You have one week to submit an abstract for CMEpalooza Spring. One of us may have told a few people the due date was January 31 when, in fact, it is actually January 30. I don’t think it’s important to dwell on the details of which one of us screwed up (hint: his name rhymes with Eric Yornick), but here is the link for submitting. Go do it now!